Our obsession with French things is not a discerning fixation. Men, women, bread, hair, style, accents, animals (French cats, it’s a thing)… the list goes on. Thus, it comes as no surprise that the beauty set’s all-time favorite moisturizer also happens to be French—and like all things French, it’s maddeningly chic yet completely unfussy. Say hello (bonjour?) 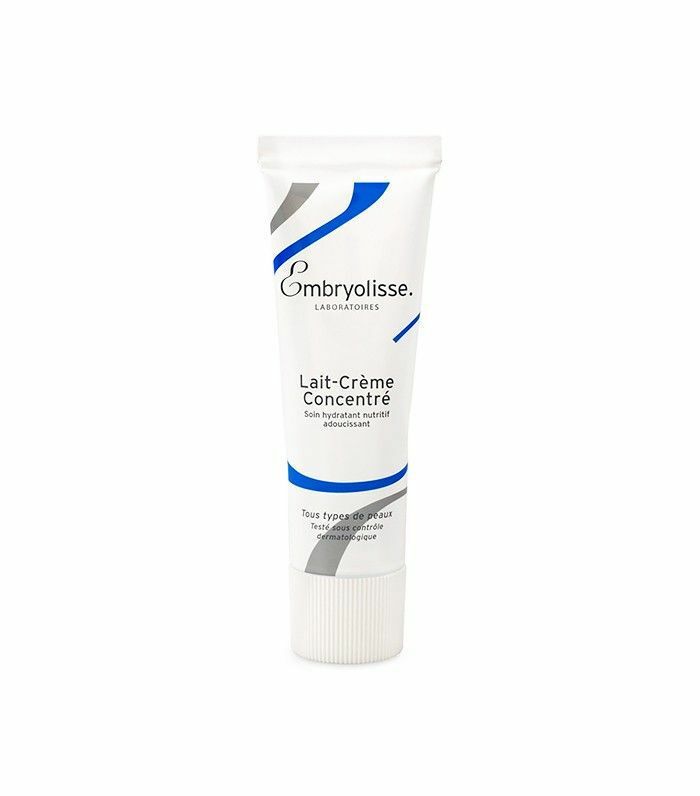 to Embryolisse Lait-Crème Concentraté ($28), the cult French moisturizer in the instantly-recognizable blue and white tube. Thanks to sites like Birchbox and beauty industry buzz, it exploded into the states a few years ago and has since become a mainstay in many a woman’s skincare arsenal. We couldn’t help but notice that makeup artists especially seem to favor the lightweight moisturizer—in fact, once we started paying attention, we couldn’t name a single makeup artist who 1.) had never heard of it and 2.) wasn’t already carrying it in their kit. What is it about Embryolisse that makes it such an industry favorite? What sets it apart from the thousands of other soothing moisturizers on the market? We went straight to the source and asked—then promptly bought a few more tubes for our emergency stash. Keep scrolling to see why makeup artists love Embryolisse! Nowadays, the moisturizer is practically ubiquitous in every makeup artist’s kit—but where and how did they first discover it? As with all great beauty discoveries, it seems word of mouth was the catalyst. “I discovered Embryolisse by seeing it day after day in all of my makeup-artist peers' kits,” says makeup artist Afton Williams, who works on campaigns for brands like Wildfox and grooms the likes of Ed Westwick. “I tend to avoid trying overhyped products, but I finally took the plunge and bought a small tube of Embryolisse Lait-Crème Concentraté ($28). The common denominator seems to be love at first sight—but why, exactly? According to makeup artist Carissa Ferreri, who counts Gina Rodriguez as a client, it’s all about the finish. “There’s something extremely special about the Embryolisse finish,” she says. “It moisturizes the face while emphasizing a beautiful glow, but it never looks greasy.” Williams agrees, saying that the moisturizer is ultra-hydrating while keeping a thin, weightless consistency—she uses the word “dewy” specifically. It’s no surprise the moisturizer also happens to remove makeup—the second ingredient is mineral oil, listed by its Latin name of paraffinum liquidum. The ingredient has received some flack over the years because it’s a petroleum-derived oil (you can read about the pros and cons here). Slight controversy aside, this oil is great for breaking up and dissolving makeup—but doesn’t actually have any active skincare benefits other than sealing moisture in. Other than mineral oil, the moisturizer is made with a few emollients (to give it that silky feel), as well as hydrolyzed soy protein and aloe vera. Though paraben free, it does contain fragrance—something to note for those with sensitive skin. Even though it doesn’t seem like there are any ingredients in this moisturizer that make it particularly outstanding, anyone who's tried it can attest that it does indeed feel amazing—and in the world of makeup artists, when prepping a canvas is often the most important part of the job, that can mean everything. Have you tried Embryolisse's cult moisturizer or any other products from the line? Tell us your thoughts below! Are You Skipping the Most Important Skincare Step?